How do you like me now? John Wall has stormed thru the playoffs, dishing out 13 assists/game and scoring 26.8 ppg. Game 5 of the series tips off tonight in Toronto. AP photo by Nick Wass. License: Standard non-commercial use. There weren’t many NBA wags who gave the 8th-seeded Wizards (43-39) much of a chance to win their first round series against top-seeded Toronto (59-23); and now that the series is knotted up 2-2 the Wiz are still the underdog in Game 5 Wednesday in Toronto, if only because the Raptors hold home court advantage. John Wall, healthy and rejuvenated for the playoffs and the best player in the series so far, may have other ideas. Wall got into a groove in the two Washington D.C. games, piling up 55 pts and 28 assists in the Wizards’ victories. The Raptors’ Demar DeRozan tried to keep up, but reverted to old habits in Game 4, throwing up 29 shots and making just ten, while an officiating crew chiefed by Derrick Stafford bailed him out early and often (Derozan shot 14 of 18 from the line). It was ugly basketball for the most part, very much what the Raptors used to do in the playoffs — rely heavily on DeRozan and PG Kyle Lowry while center Jonas Valanciunas worked underneath to pull them along as far as he could. That was all the way to the Eastern Conference finals in 2016, though they lost as much as they won on the 20-game run (the Raptors won 10, lost 10, needing Game 7 wins to push past the Pacers and the Heat in the first two rounds). Though DeRozan leads the series in scoring with 28 pts/g, his per game BIER is a pedestrian 6.25. Wall leads the series with a 12.82 BIER/gm, while Valanciunas in limited minutes (just 21.3 minutes/gm) is leading the Raptors with a high impact 10.72 BIER/gm. If this series could be billed a “Battle of the All-Star guards”, Wall and Bradley Beal are winning the battle, though not the war — not yet anyway. Regular season BIER vs. playoffs BIER/gm for the guard match-ups in the Wizards-Raptors series. For the basics of the BIER model go to BIER Basics page. Also see BIER season leaders post at the outset of the playoffs. Wall and Beal are averaging 49.5 pts/g and a combined BIER/gm of 20.23 — a ton of efficient production for a pair of guards. It’s also the inverse of what Wall and Beal vs. Lowry and DeRozan looked like in the regular season (13.73 BIER/gm vs. 17.55). On the other Washington wing, Otto Porter and Kelly Oubre have been relatively quiet, which means the Wizards still have options to exploit in the final three games. On paper, if Wall is healthy and at the top of his game (which he is), the advantage at guard and on the wings should go to the Wizards. The Raptors may rationalize that Wall can’t play much better than he did in the first four games, and yet the series is tied. DeRozan, on the other hand, certainly can play better than he has, and the series is tied. Memory can be short when one is bombarded with new images and information every day, but it wasn’t too long ago that the Wizards were on the verge of the Eastern Conference finals. They were, in retrospect, a more competitive opponent for the Cavs than the Celtics (the officiating in Boston in Game 2 of the Wizards vs. Celtics series played a role in the C’s winning the series). The 2018 Wizards are the same cast, plus a stronger bench thanks to Thomas Satoransky and the ever-improving Oubre. The Raptors bench was the talk of the NBA earlier this season, and the keys there are 2nd-year center Poeltl and guard Delon Wright, 18 points on 7-10 shooting in Game 1. 3-point specialist C.J. Miles also shot well in Game 1 (12 pts on 4-7 shooting from three), so the Raptors bench rescued Game 1, despite the great series Wall is having. My early prediction that the Wizards would take the series didn’t look so good. And now? I’m looking forward to a great Game 7. This entry was posted in BIER, NBA Playoffs, The Jinx and tagged Bradley Beal, Delon Wright, DeMar DeRozen, Jakob Poeltl, John Wall, Jonas Valanciunas, Kelly Oubre, Kyle Lowry, Otto Porter, Toronto Raptors, Washington Wizards on April 25, 2018 by J.D. Mo. 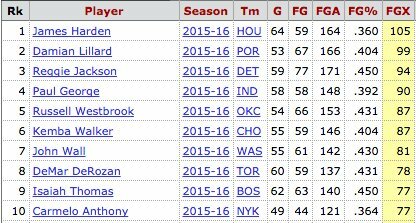 Basketball-reference.com posted the always interesting 2015-16 clutch shooting stats via their twitter feed Saturday. The top 10 list below answers the question: What do NBA stat geeks do on the weekend? But it also tells an illuminating story about the state of most of the current NBA, where the pace is picking up but scoring is not; and where the most 3-pointers in league history were shot while offensive rebounding hit an all-time low. Note that there are no Warriors, Cavaliers or Spurs on the list (no Bucks either) — and no big surprises. Not one of these ten players was in the top 20 in 3-point % last season, yet five were in the top 20 in 3-point attempts (Harden, Lillard, George, Walker and Thomas). All of them were in the Top 15 in field goals missed, with the guy with the best shooting % in the final 4:00, Reggie Jackson, ranking 15th. Seven of these guys were All-Stars last season (Lillard, Jackson and Walker were not). Eight were on playoff teams last year (Wall and Anthony were not), making for some nearly unwatchable basketball in the early rounds. Six are point guards plus Harden, who tries to play three positions simultaneously. Two are wildly inconsistent Kobe-formula All-Stars (George and DeRozan). And there’s Carmelo. Every player on this list is on a team that would likely win more if the player shot less, passed more and took better shots. Meet the marksmen of mediocrity, the top 10 gunners who shouldn’t in the final 4:00. 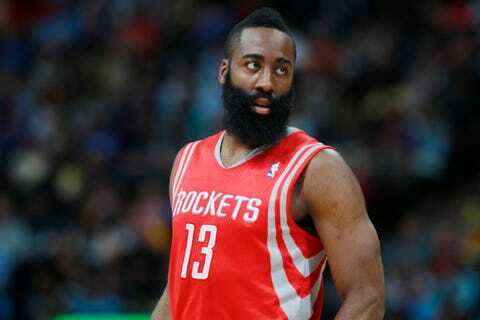 Harden called a reporter a “weirdo” for questioning his 29% shooting in the 2014 playoffs vs. Portland. The Rockets lost the series. 1) James Harden was 2nd in the league in scoring (29.0 pts/gm) but got off to a horrendous start 2015-16, dug his team into a hole early on, and led the NBA in missed shots and turnovers. He posted his lowest 3-point shooting % in the last 5 seasons yet shot more threes than anybody but Stephen Curry. Harden’s stat sheet is filled with such absurdities, his Rockets were next to unwatchable, and the center, Dwight Howard, opted out for bigger green and greener pastures. (Edit: Howard signed with the Atlanta Hawks). 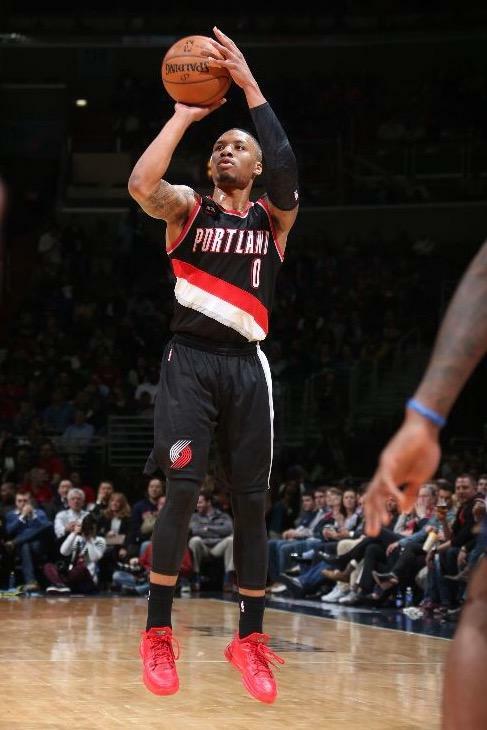 D. Lillard. When you’re this wide open, you should definitely shoot it. 2) Portland wasn’t supposed to do anything last season, so Damian Lillard shot more than he ever had in his career, missed more than anybody but Harden, shot less than 42%, and was snubbed for the All-Star game. Thanks to some Allen Iverson-type heroics from Lillard, however, and teammates that hustled for the missed shots and won 50/50 plays (much like Iverson’s Sixers), the Trailblazers had a surprising season. They even won a playoff series. 3) Reggie Jackson went from OKC to Detroit in 2015 after Brandon Jennings went down with a snapped Achilles tendon, and Jackson helped lead the Pistons to the playoffs for the first time since the Allen Iverson experiment. Having paid a fair amount of attention to the Pistons last season, I can say they lost a bunch of close games (hack-a-Drummond played a role there) and that Jackson and shooting guard Kentavious Caldwell-Pope shot their team out of a few of those. However, note that Jackson’s 45% shooting in the final 4 minutes is tied for tops on this list, and that 7 of the ten guys on the list played in the East. This means that the competition usually shot worse than Reggie, yet, somehow the Pistons were unable to catch the Pacers in the standings and were stuck playing Lebron and the Cavs in Round 1 of the playoffs (they were swept). Paul George shooting, I think. This is not good form, kids. 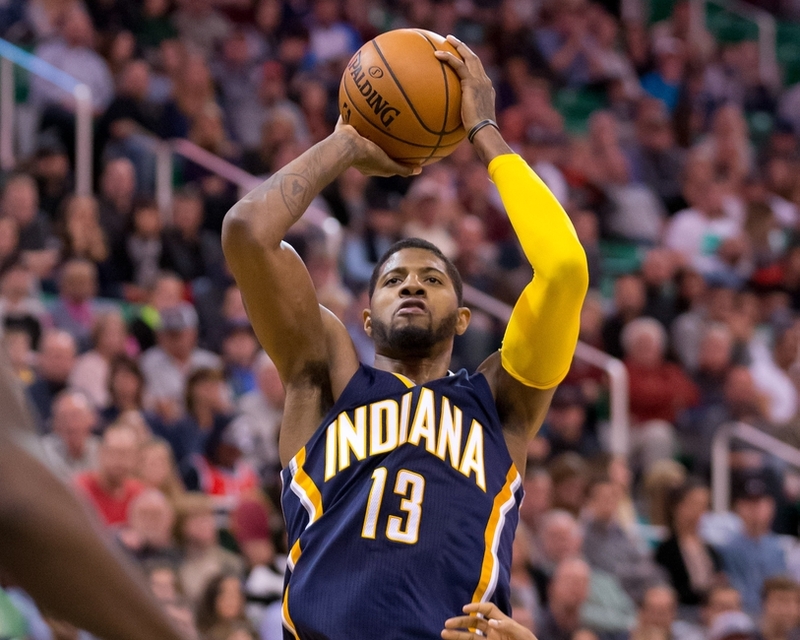 4) Paul George shot less than 42% last season and missed more than anybody but Harden and Lillard. Despite the Pacers 3rd-best team defensive rating, George’s inefficient offensive play, along with Monta Ellis‘ usual madness and poor outside shooting, exiled the Pacers to mediocre-ville, prompting the firing of coach Frank Vogel. Will new coach Nate McMillan be able to bring sanity to the Pacers’ offense? We shall see, but note that George shoots below 40% outside of three feet from the basket, and under 40% in the final four minutes (see above chart). That’s worse than mediocre, though his 3-point % is not. The Pacers crash to mediocrity was predicted here three years ago, and, well, we know what happens to most mediocre NBA teams. They don’t win, nor do they remain mediocre. Let’s see how long GM Larry Bird waits before overhauling the roster. And look, I finally spelled Monta right. 5) Russell Westbrook would be near unstoppable if he played smarter and remembered more often that he plays with Kevin Durant (who’s not on this list of failure, you’ll note). The Thunder finished ahead of only the lowly Sixers in 4th quarter scoreboard differential last season, and a lot of it had to do with the hero ball that Westbrook and Durant like to play down the stretch (and that the OKC bench had a habit of losing big leads.) It’s scary to think that OKC has so much room for improvement, but they do. The Thunder upgraded their roster last week with the trade of Serge Ibaka for Victor Oladipo and Ersan Ilyasova. (This was written before Durant bolted for Golden State, obviously). This is not a good shot. Kemba Walker underwent successful surgery on his left knee in May. 6) Hard to believe Kemba Walker missed so much in the final 4:00 last season, given his uncanny success killing the Bucks in close games. Walker shot 46% (12 of 26) from three vs. the Bucks last season. Thanks in part to the Bucks, he led the league in clutch scoring, according to the Hornets, narrowing it down to the final 2:00 of games decided by 4 points or less. His Hornets moved up in the East and won 48 games, but Hornets fans shouldn’t get too happy. The success had as much to do with the competition in the East than the Hornets’ competence — Charlotte was 20 wins, 3 losses against the Bucks (3-1), Magic (3-1), Knicks (3-1), Pacers (3-0), Nets (4-0) and Sixers (4-0). But maybe they should get happy — all of those teams are still in the East. 7) Surprised John Wall is on this list? I am too. The Wizards were limping around for most of last season, and Wall and shooting guard Bradley Beal seemed at times exhausted by it all — when they both played. Wall had to take on added responsibilities due to the injuries, and, obviously, this resulted in more shots and fewer of the surgical passes he’s known for. DeRozan and George battled it out in the playoffs, and it wasn’t pretty. DeRozan shot 32% from the field in the series, with George hacking him every step of the way. 8) DeMar DeRozan shot so poorly (39% including 15% on threes) during the playoffs that he should have been fined. Yet somehow he made another All-Star team and Toronto had its most successful season in history, losing to the Cavs in the East Finals — but only because Miami center Hassan Whiteside‘s knee gave out during the series with the Raptors. They were nearly unwatchable in the playoffs. In the Pacers series, DeRozan’s eFG% was 33%, but, in all fairness, the refs kinda let George push him all over the court. Double D had a “Kobe formula” stat line on the season, and, well, being on this list is part of having a Kobe formula stat line. 9) Isaiah Thomas is an electrifying young point guard, but he’s so small at 5’9″ that he gets worn down by the 4th quarter. Boston GM Danny Ainge desperately tried to trade the No. 3 pick in the draft for an established No. 1 scoring option at shooting guard/small forward but the Bucks (Khris Middleton), the Bulls (Jimmy Butler) and the Jazz (Gordon Hayward) all rejected the offer. This may be an actual case where Thomas needs better-shooting teammates to stay off lists like this one. But note that he did tie with Jackson for best shooting % on the list. Boston won 48 games, so it follows that opponents were usually shooting worse Thomas in the 4th. Still Carmelo after all these years. 10) A study a few years ago showed that Carmelo Anthony was the best clutch-shooter among the big names in the league, going all the way back to the early 2000s when Kobe and Shaq were winning titles and McGrady seemed unstoppable. Carmelo has slipped, but then his 2016 Knicks were in a holding pattern, firing another coach and waiting for the free agents of this summer. Carmelo laid back last season, played some good team ball, and enjoyed the surprise development of teammate Kristaps Porzingis. I was actually surprised to see him on this list, but then, scorers will try to be scorers, whether they’ve lost a step or not. What have we learned from this list? High volume – low efficiency scorers may find their way onto All-Star teams and ESPN’s Sportcenter … if they shoot enough and don’t play in Portland or Charlotte (or Milwaukee). But they’ll eventually drive their teams to mediocre-ville and take up residency there, where the fishing is always good in May and June. This entry was posted in The Jinx and tagged Carmelo Anthony, Damian Lillard, Demar DeRozan, Isaiah Thomas, James Harden, John Wall, Kemba Walker, Kevin Durant, Paul George, Reggie Jackson, Russell Westbrook on June 26, 2016 by J.D. Mo. The Bucks went to Washington, D.C. last February figuring to toss a win against the Wizards into their 8th-seed hamper. John Wall hadn’t been a problem in his first meeting with the Bucks in Milwaukee (a 100-87 Bucks win), and, this time, Brandon Jennings was back in the Bucks lineup after missing six weeks with a foot fracture. What Jennings and mates found in Washington was Nick Young‘s afro and Nick Young’s jumpshot. 26 points from Young later and the Bucks were 100-85 losers – and nothing resembling the playoff team they had hoped to be and thought they were. Nick Young is a Bucks killer, and it was an efficient killing: 10-19 shooting, three from Downtown, 3 of 3 from the line. Young was aided by guard Cartier Martin, who made five from downtown and scored 15. The Bucks tried, oh they tried to guard the three point line. John Salmons was no slouch defender. Salmons is no longer a Buck, and Stephen Jackson will hawk the 3-point-line for the Bucks tonight at the BC against the Wiz. Martin is no longer with the Wizards. But Young will be in the building, starting at shooting guard. Last season he averaged 19 in three games against the Bucks, better than his 17.4 pts per game average, and they needed to hold Young to ten in the third meeting to get it down from 23.5 in the first two. In the 2009-10 season, Young averaged 20.2 in the four games the Wizards split against the Bucks. Seven games in two seasons, three losses to the Wiz. In the two wins that Young started in, he averaging 23.5 points per. Nick Young is a Bucks killer. This entry was posted in The Jinx and tagged Brandon Jennings, Cartier Martin, John Salmons, John Wall, Nick Young, Stephen Jackson, Washington Wizards on December 31, 2011 by J.D. Mo.